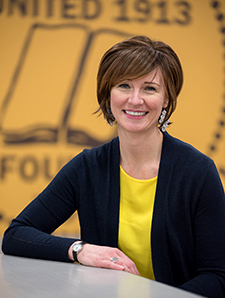 With a strong background in leadership, community service and client relations, Christie Davenport ’01 brings an impressive skill set to her new role as director of alumni engagement at Baldwin Wallace University. Davenport, who was named to the position following a national search, brings impressive finance and event management experience to the role. Prior to her appointment, she served BW as a corporate and foundation engagement associate, where she supported philanthropic and strategic initiatives that spanned relationship building, donor relations, fundraising and special events. “As a proud BW alumna for over 17 years, I bring the passion that I have for this university to my new role,” noted Davenport. “It’s the shared passion of our nearly 50,000 alumni, which I believe unites all generations of BW alumni. “I’m excited to hear the many BW stories from our alumni and the community. We all have a BW story to tell. My BW story is such an instrumental part of my life. When I left my hometown of Salamanca, New York, at age 17, I could not have imagined how BW would change my life,” said Davenport. As a student, she majored in theatre. She married BW business administration major Kevin Davenport ’99 in 2004 at the Lindsay-Crossman Chapel and began her career as director of event management at St. Bonaventure University in New York. Her career progression led to finance positions with Northwestern Mutual and Davenport Wealth Management. “Alumni are the backbone of Baldwin Wallace,” believes Patrick Dunlavy, vice president of philanthropy and alumni engagement. “From athletes who support the success of current and future Yellow Jackets in our newly formed Brown & Gold Club to the many BW-sponsored professional and social events each year that unite generations of alumni, we share not only wonderful memories about the university but provide generous philanthropic and volunteer support. “Christie’s new role is just another transition into something she’s been doing since graduation. She genuinely cares about BW and alumni. Community is important to her. She volunteers with Junior Achievement of Greater Cleveland, Berea Arts Fest and Women for BW,” he continued. “Her enthusiasm as well as her professional and people skills make her a natural for the position. She is a strategist, a communicator and a leader. We look forward to seeing her new initiatives that will further engage our wonderful alumni,” he added. Baldwin Wallace University is an academic community committed to the liberal arts and sciences.